The amount of torque applied to a bolt / nut is determined by setting a specific pressure for the pump to deliver to the wrench. 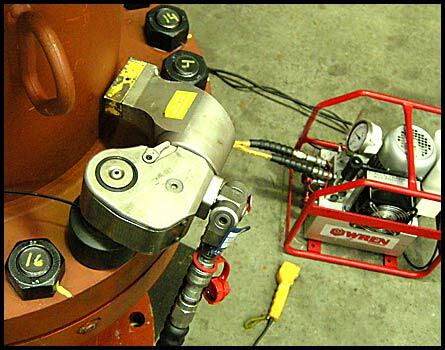 When that specific pressure is reached, the wrench will "stall" (stop rotating). Thus the amount of torque delivered by the hydrauliccylinder is matched (equalled) by the resistance of the bolt being tightened. The torque-value is a measure of the fictional forces applied to a thread. A Torque-Chart is a set of PSI pressures matched against Torque-values. See an example Chart here for a WREN IBT 1" Drive Tool. The PSI Pressures are set on the Pump and delivered to the wrench via a hose. The adjustable Pump valve is an important part of the whole procedure and should be adjusted with close attention. When Calibrating a Tool, its best to calibrate with the specific pump that will be used with that tool. Then the pump, guage and valve are all matched to the Tool, giving the most accurate settings. Hydraulic-Equipment generally is very accurate with highly preditable and repeatable results over time, however its still required to Callibate tools once every year. see more on Callibration. What Torque value is required? You must know what the value needed for each Bolt fastening application when using a wrench. From the Chart trace from the Torque-column across to the PIS pressure column, giving you the required PSI Setting for that specific Tool. The higher the Pump pressure, the higher the torque-output. To undo bolts simply reverse the square drive in the Tool and use the max torque setting. See wrench Video operation. Undoing Bolt, also called Breakout, usually needs far higher-torque values than when they were first tightened. This is due to over time the temperature changing and stresses within the bolt housing being released, increase the Frictional Forces within the thread.